IQ Media has worked for F Ball & Co for over 18 years helping them to develop their market leading position through innovative and effective digital communications which include – responsive websites ,web applications, corporate videos, numerous training and product launch videos , Recommended Adhesive Guide apps, their own content player the iBall Player and effective use of social media channels, supported with an effective SEO campaign..
We first built and launched their very successful Recommended Adhesive Guide (RAG) App in 2011, this has been updated quarterly with over 5000 downloads since launch and over 300 interactions each week. 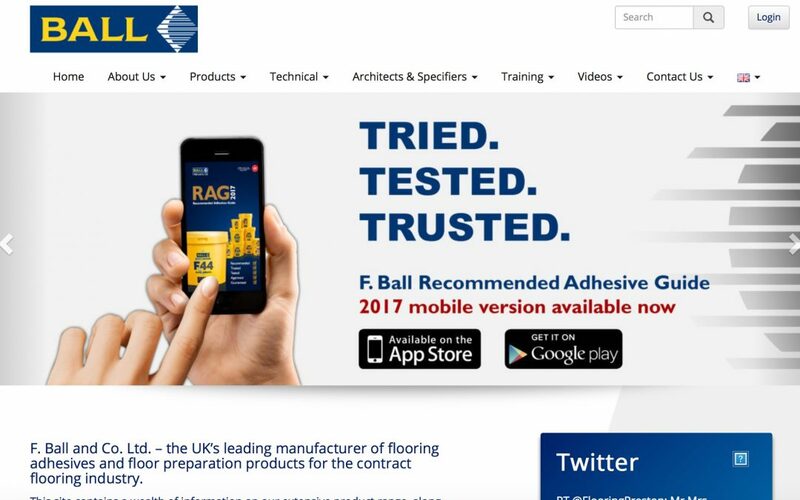 The RAG App is used regularly by architects, specifiers and contractors. We have used the above to develop targeted highly effective lines of communications with contractors, wholesalers and specifiers that drive sales significantly from launch and promote products, reduce costly returns through incorrect product usage, whilst providing a high level of customer service through valuable training.